If you have Type 2 diabetes, whether recently diagnosed or ongoing for years, this book will open your eyes to a new type of thinking about the real cause of your diabetes and the right cure that will reverse it. After reading this book, whatever you thought about diabetes will change. If you think that diabetes is your destiny because one or both of your parents had it, you will learn that what you have inherited is only a potential. If you think Type 2 diabetes cannot be “cured,” this book will show a completely different picture. 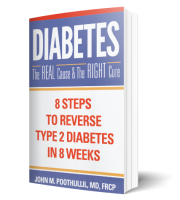 The fact is, you can reverse high blood sugar and diabetes in as little as 8 weeks using the 8 steps in this book. Think of the freedom you will feel by not having to carry food with you when you travel or arrange for special food to be available at your destination because you are taking diabetic medications. Think of not having to get up from sleep with perspiration, palpitations, and panic due to a hypoglycemic episode. Think of not being afraid of experiencing the mental cloudiness and confusion associated with low blood sugar that happens in a Type 2 diabetic on medications. Think of the joy you will experience to be able to eat when you are hungry rather than on a schedule, or to be able to skip a meal if you want without having to worry about the serious consequences of hypoglycemia. This is an excellent book, intelligently written with a lot of new scientific knowledge included. I am looking forward to reversing diabetes by using these techniques. Dr. Poothullil is very credible and gives a lot of great advice. I’m impressed and highly recommend this book.